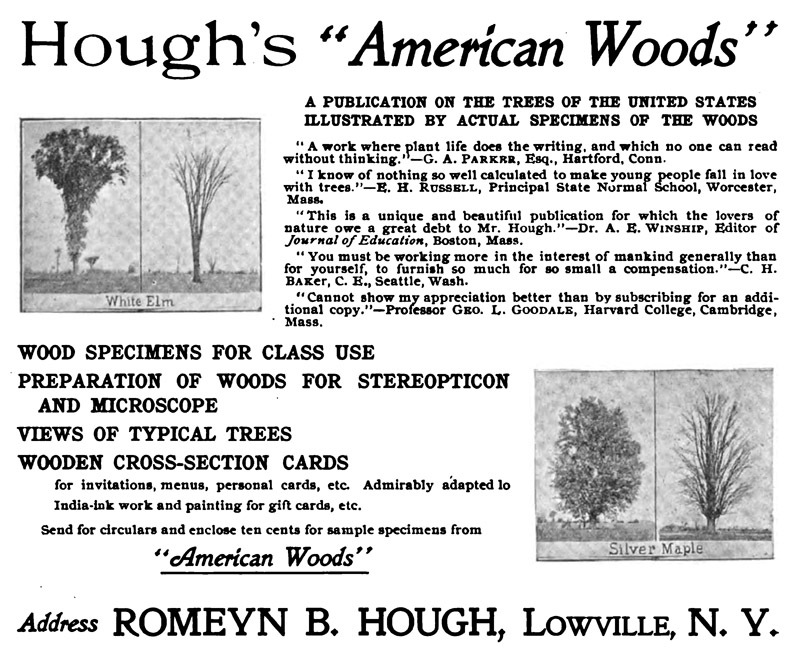 Romeyn B. Hough was a U.S. botanist who specialized in trees, and an inventor, entrepreneur and publisher. He developed a veneer knife that was capable of slicing woods down to 1/1200 inch thickness. With that device, he produced a series of books on American trees, which featured actual sections of woods, microscope slides, magic lantern slides, and printed cards made of real wood. 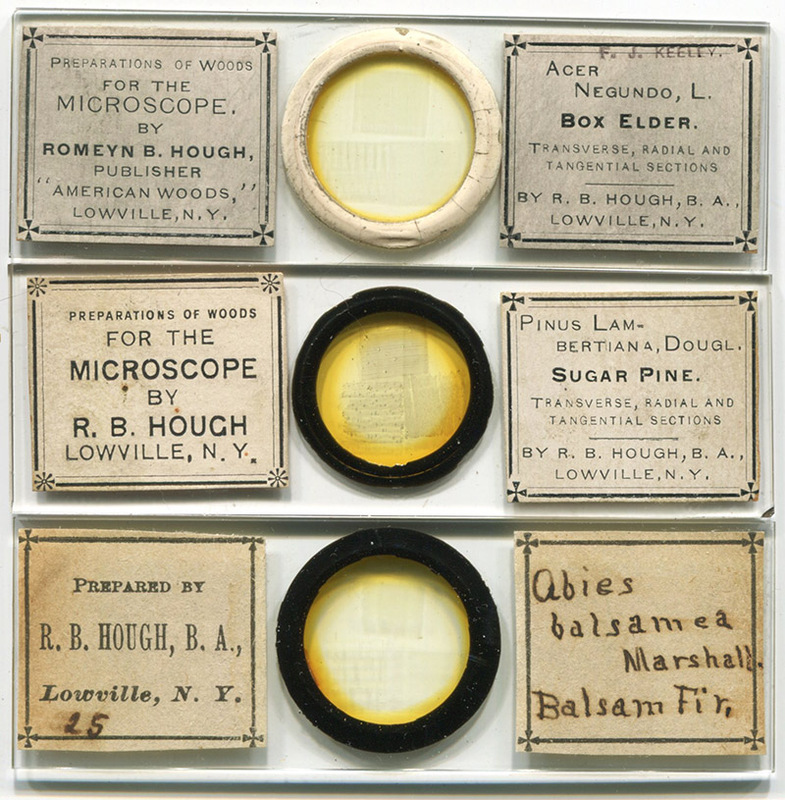 Hough’s microscope slides are of excellent quality, yet they are rarely encountered at auctions. This is not because of limited production – in 1915, Hough boasted of supplying 1500 microscope slides to a single school. Perhaps they are still in use for dendrology labs? More likely, as seems to be the case with the works of many other American mounters, the current owners do not know what they have, and do not realize that high quality antique microscope slides are in demand by collectors. Figure 1. Three Hough microscope slides, sections from box elder (Acer negundo) sugar pine (Pinus lambertiana), and balsam fir (Abies balsamea). To judge from the labels, they are probably arranged as newest to oldest, top to bottom. Figure 2. 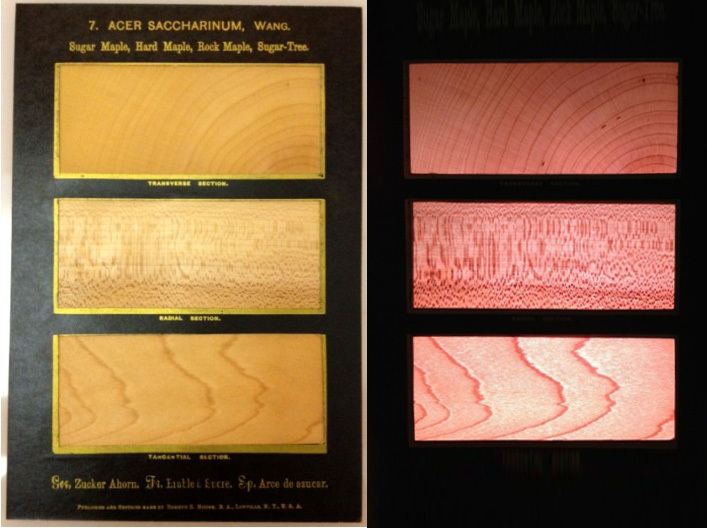 Magnified views of the box elder woods in the Figure 1 slide, (left to right) transverse, tangential and radial sections. Photographed with a 10x objective lens. Figure 3. A ca. 1916 photograph of Romeyn Beck Hough, from ‘California’s Magazine’. He is displaying sections from ‘American Woods’. 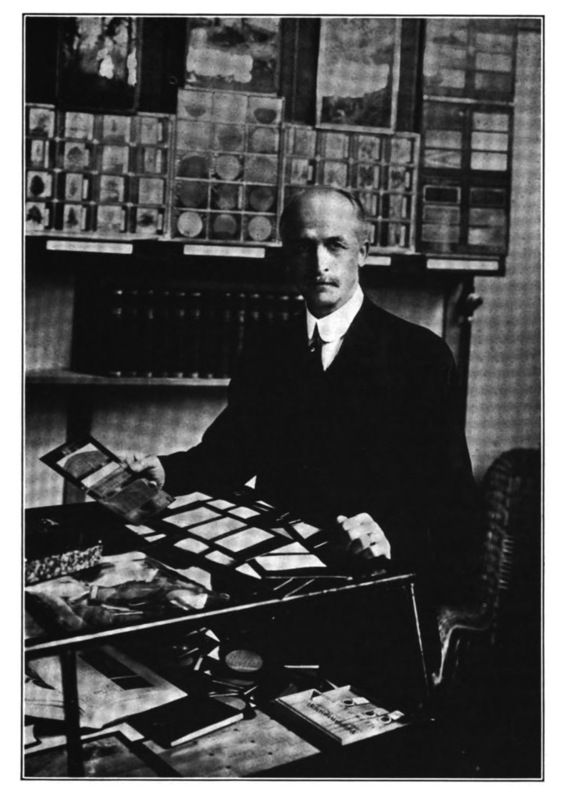 Behind him are magic lantern slides, consisting of wood sections and photographs of trees. Romeyn’s father, Franklin B. Hough, was a pioneer of forest management, first chief of the U.S. Division of Forestry (the predecessor of the U.S. Forest Service), and is widely considered to be the “Father of American Forestry”. Romeyn earned a degree in botany from Cornell University in 1881. Then, according to the obituary written by William Trelease, Hough “qualified as a physician, like his father; but he really became in a sense a manufacturer and publisher, combining avocation with vocation, for he manufactured structural sections – macroscopic and microscopic – of trees that he knew so well”. 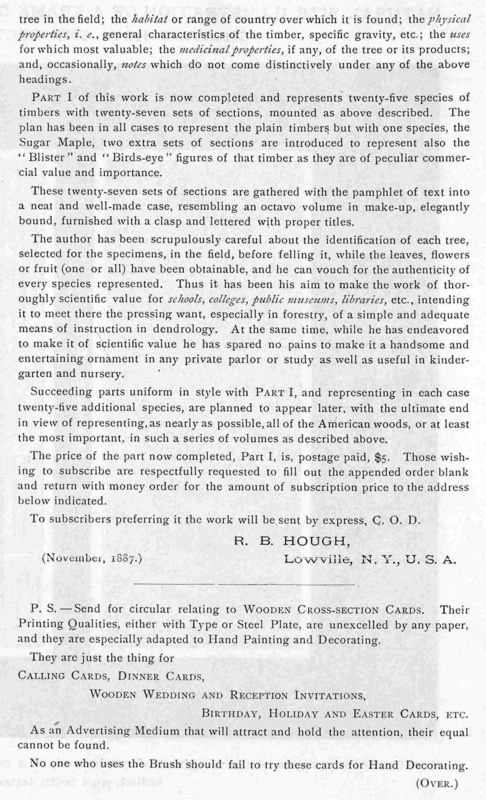 In 1884 Hough applied for, and in 1886 received, a patent for his process of making thinly-sliced sections of wood that are suitable for sturdy “cards”. A strong selling point for these cards, stressed in advertisements, was that their uniqueness virtually guaranteed that recipients would keep them. 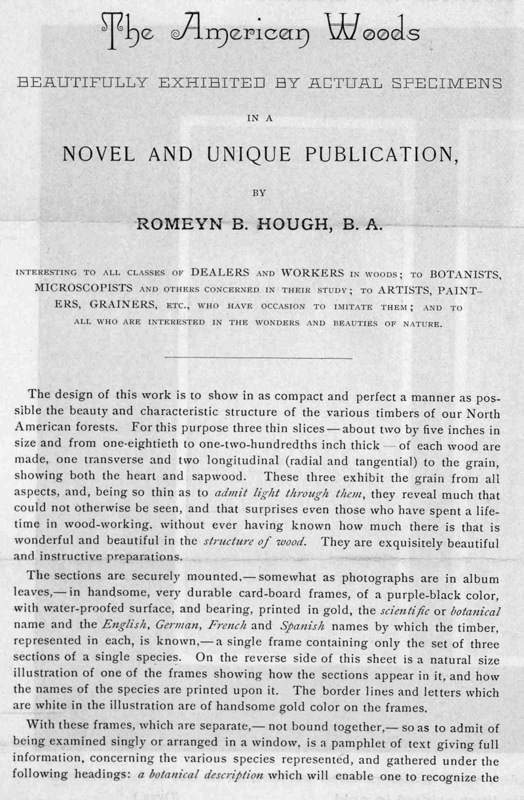 Excerpts from Hough’s patent describe his process for producing the novelties, “The object of my invention is to provide flexible wooden cards suitable, for use as business or fancy cards, or cards for use in photography, the arts, &c., the same being cut either obliquely or transversely across the grain of natural wood. In the accompanying drawings (our Figure 4), Figure 1 is a side view of a block of wood from which the cards are cut. Fig. 2 represents a card cut transversely across the grain of the wood or in the direction indicated by the line x-x of Fig. 1. Fig. 3 is a like view of a card cut obliquely across the grain of the wood or in the direction indicated by the line y-y in Fig. 1. The wood from which the cards are cut should be unseasoned and used as soon as possible after the tree is cut. It should be worked into blocks of the size desired. The knife used in cutting the sections or cards is made of a heavy plate of steel having its cutting edge in a line diagonal to the length of the blade. The block from which it is proposed to cut the cards should be securely held in position by means of clamps, and is caused to move beneath the knife, which has a vertical motion communicated to it by means of the ordinary Wheel and pitman. The knife should be sufficiently heavy and securely adjusted to prevent vibration. When it is desired to cut the cards transversely across the grain of the wood, the block is secured in a horizontal position when brought in contact with the knife. After each upward movement of the knife the block is moved forward a sufficient distance to cause the knife in its succeeding downward movement to cut from the block a section or card of the thickness desired. Sections may be cut at any desired angle across the grain of the wood by varying the position of the block and causing the same to pass beneath the knife at the angle desired. After cutting, the cards should at once be placed between heavy sheets of blotting-paper or other substance adapted to absorb the moisture, and should be allowed to dry under pressure for several hours, care being taken not to permit them to remain too long in the press. .. When properly prepared in the manner described, the cards will be both durable and flexible. Being cut across the grain of the wood, the annular rings of growth and the structure of the wood are shown to advantage. 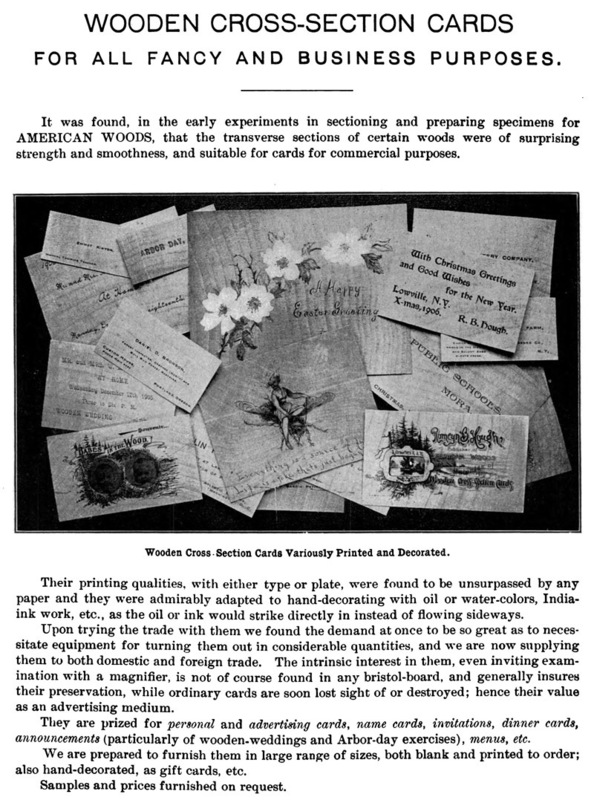 The surface of the card will be smooth and suited to receive the impression of type, or they may be used for writing, artistic drawing, painting, or other uses to which cards heretofore manufactured are adapted”. Figure 4. 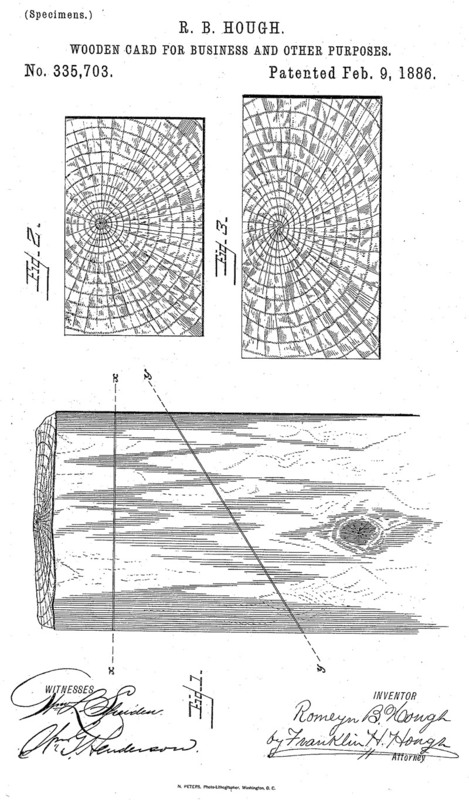 Figures that accompanied Hough’s 1886 patent on the thin-sectioning of woods for use as cards. Figure 5. Front and rear views of a surviving Hough wooden business card. Note that the wood is so thin that the printing can be seen through the card’s back. Figure 6. 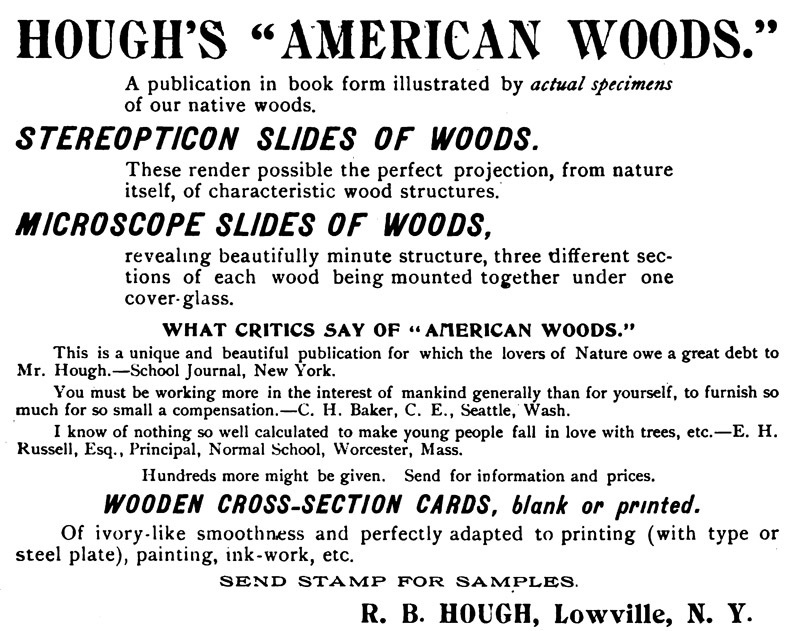 An 1907 advertisement for Hough’s wooden cards. An accompanying price list stated that wooden cards, of the size of a modern business card, would cost 60 cents per 100. Printing (per 100 cards) cost 25 cents for the first line, and 5 cents per additional line, so reasonable business cards would cost about 1 cent each. At that same time, Hough was applying his section-cutter to producing his series of American Woods. Originally planned as 15 issues over time, he produced 13 different volumes between 1888 and 1924, and the fourteenth was issued by his daughter after Romeyn’s death. Each contained thin sections of real woods - three sections per species (transverse, tangential and radial sections) – with about 25 tree species per issue. An 1888 review from The American Naturalist described them, “The specimens .. (are) each about four and a half inches by one and three quarters. They are neatly mounted in black cardboard frames, six by nine inches. Upon these frames are printed the scientific name, the various English, German, French and Spanish popular names. The text is a pamphlet of eighty pages, neatly printed, and illustrated with forty-two wood-cuts. The introductory portion includes an account of the structure of the stem leaf, inflorescence, flower, fruit and seed, with definitions of the technical terms necessarily used in their description. There is also a short discussion of the physical properties of woods. Then follows an index-glossary. Forty pages are devoted to a systematic study of the species represented in the sections. Under each species there is first a specific description of the tree given in quite popular language; then follow geographical distribution, physical properties, uses, medicinal properties, etc. Accompanying this part are three keys to the species: the first based mainly upon the flowers, the second upon the leaves, and the third upon the fruit. The work will be a most valuable one, and it is to be hoped that it will be continued to completion. Every botanical department ought to afford this set, as the price ($5 per volume) is very reasonable. The volumes are put up in book form, so that they may be placed upon ordinary library shelves”. Further details can be read in Hough’s 1887 prospectus, reproduced at the end of this essay. 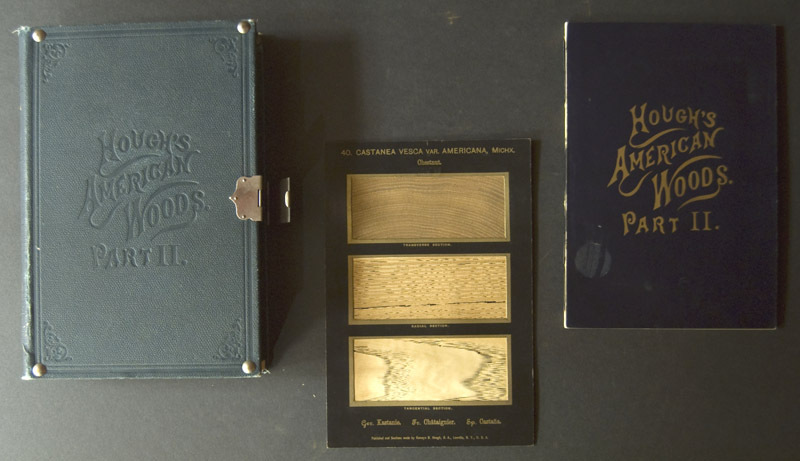 American Woods received a grand prize at the 1889 Paris Exposition, and gold medals at the Columbian, Pan-American, Louisiana Purchase and Alaska Yukon Expositions. Figure 9. 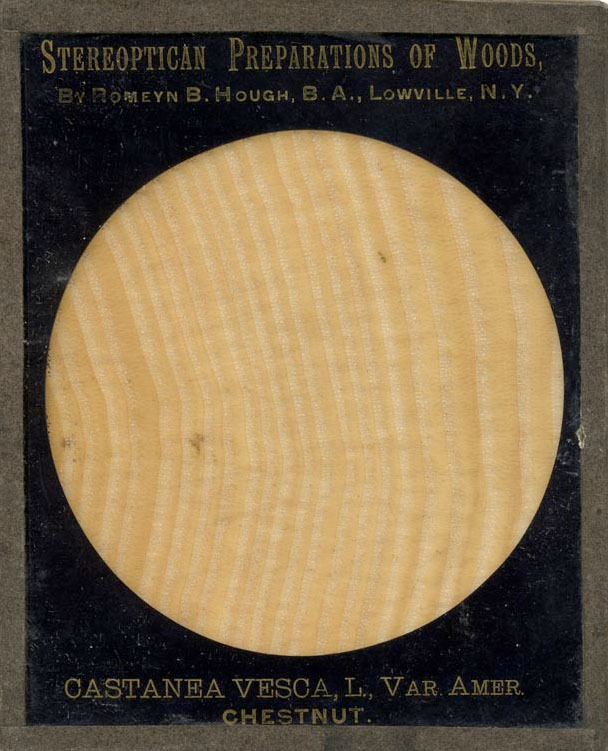 Romeyn Hough also applied his section-cutter to making thin-sections of wood for use in magic lantern projectors. This permitted groups of people to simultaneously examine the fine details of a real piece of wood. Figure 10. Advertisement from the 1891 Cornell University course catalog. Note that Hough was already offering slides for the microscope and lantern (“stereopticon”). Figure 11. An 1895 advertisement, from ‘The Observer’. Figure 12. 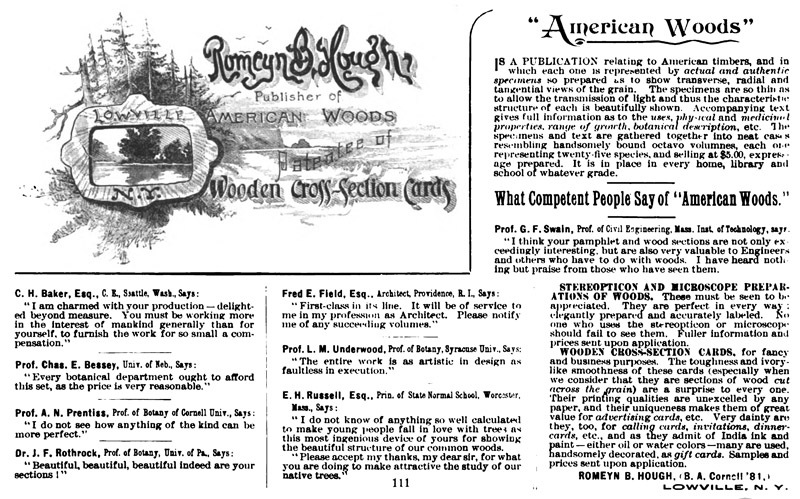 1899 advertisement, from ‘American Forests’. Figure 13. 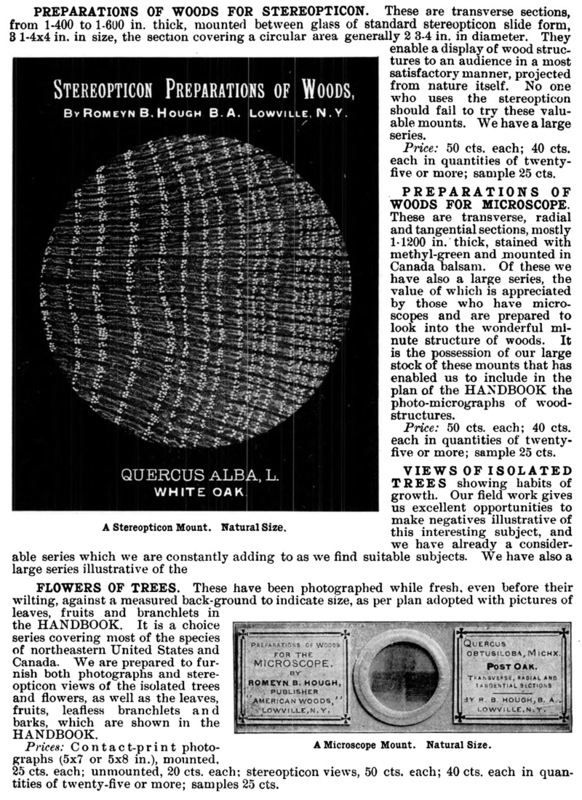 The back of Hough’s 1907 ‘Handbook of the Trees of the Northern States and Canada, East of the Rocky Mountains’ included several pages of advertisement for his other productions. Figure 14. An advertisement from ‘Forest Leaves’, 1915. Hough, Romeyn B. (1907) Handbook of the Trees of the Northern States and Canada, East of the Rocky Mountains, R.B. Hough, Lowville, N.Y.
Hough, Romeyn B. 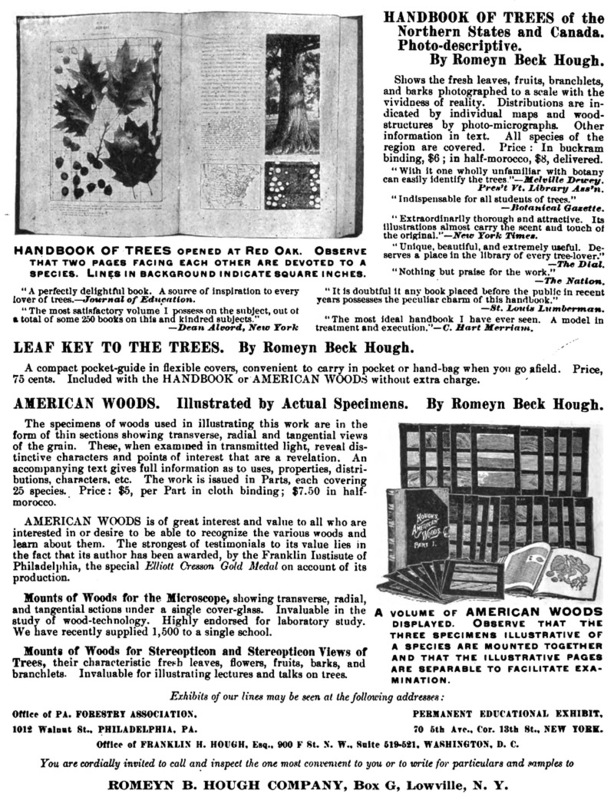 (1910) Leaf Key to the Trees of the Northern States and Canada: and a Botanical Glossary, R.B. Hough, Lowville, N.Y.